HTML files, in this context, are html files used to embed the survey pages within an html page. This html file can be used as a 'template' for surveys, which makes it easy to integrate surveys with the layout of your existing web portal, for example. To upload a reusable HTML file, click on the 'Upload' tab when viewing the list of HTML files (either 'My HTML files' or 'Common HTML files'). Locate the html file that you want to upload by clicking on the 'Browse' button. Type in the new name (optional) and select the list ('My HTML files' or 'Common HTML files') to which you want the css file to be uploaded (applicable for 'super users' only). If a file with the same name already exists in the list, you must either specify another filename or check the 'Replace if exists' checkbox, in which case the existing file will be overwritten. 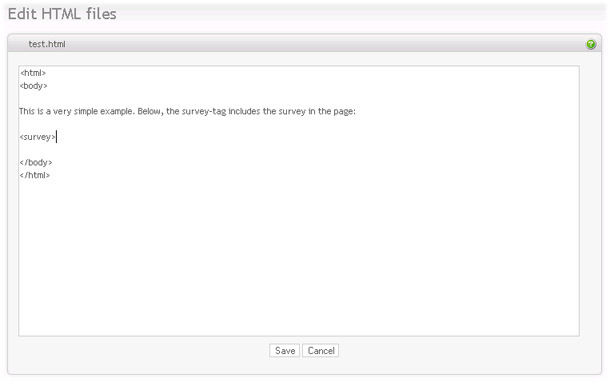 The upload file must be a valid HTML file and must include the survey tag <survey> at the position where you want the survey to be displayed. To edit a reusable HTML file click on the HTML file in the list (only 'super users' can edit files in the 'Common HTML files' list). An HTML file can be downloaded to disk by clicking on the 'download' link in the Action column. Downloading a HTML file is useful if you want to use another HTML editor to edit your HTML files, or if you want to use the same HTML file within another installation of Opinio.